When you first buy your smoothie maker you will want lots of delicious recipes to try out, here are two of my all-time favourite banana smoothie recipes. The first of my banana smoothie recipes is this delicious passion fruit and banana one, it is so light and frothy, with the inclusion of sparkling mineral water and yet is has a really creamy taste too. I hope you will enjoy it as much as I do. 2 Passion fruit, you only use the inside flesh so cut the fruits in half, scoop out the flesh with a teaspoon and press this through a fine mesh sieve using the back of a spoon to remove the seeds. To make the smoothies, just add the fruit to your smoothie maker, pour on the yogurt and blend until really smooth and frothy – the time you need to whizz this up will depend on your blender but no more than about two minutes. Pour this mixture into two tall glasses and then add the sparkling mineral water. This drink looks nice with a little ground nutmeg sprinkled over but this is not essential. Serve right away. This is a deliciously decadent mixture of ripe bananas and creamed coconut and fragrant, summer strawberries. It is perfect for a hot summer afternoon and the recipe makes four smoothies so it’s perfect for sharing too! To make the smoothies, put the chopped bananas and hulled strawberries and the creamed coconut into the smoothie maker or blender and add the water. If you have a stirring stick on your smoothie maker, this might come in useful with this recipe as the creamed coconut does tend to get stuck to the sides! 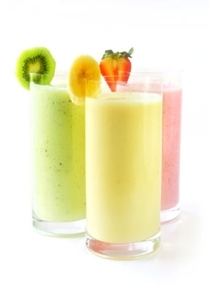 When everything is whizzed together, add the milk, lemon juice and the ice cubes (tip, if your blender will not crush ice very well, put the ice cubes into a plastic bag and hold the end closed and bash the bag with a heavy rolling pin on a hard surface – then add the contents to the blender)! Whizz together until smooth. Finally, when you have made your deliciously creamy banana smoothie recipe, pour the mixture into four tall glasses and decorate the tops with the remaining strawberries, either sliced and popped onto the top of the drink or left whole and skewered on a cocktail stick. Serve right away.